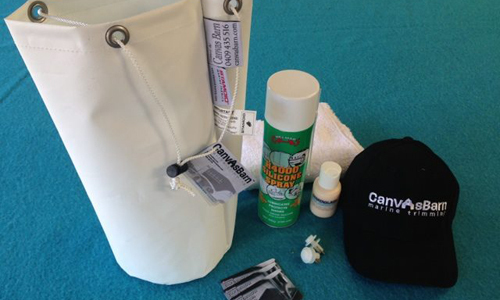 WHO IS CANVAS BARN MARINE TRIMMING? WELL, TO PUT IT SIMPLY, WE’RE A TEAM. Aaron Stroud is a real local. He grew up in Lakes Entrance and went to school there. Aaron did his apprenticeship in upholstery using traditional techniques. He has now been working in Lakes Entrance and surrounding area for over 25 years. This means he brings a wealth of skill, local knowledge as well as experience to your job. He is a highly skilled craftsman. Aaron personally completes all the work on your covers, from start to finish, so you are assured of the highest standard of work. Canvas Barn Marine Trimming specialises in high quality marine trimming. Aaron still does some specialist upholstery jobs, for art projects and antique work. 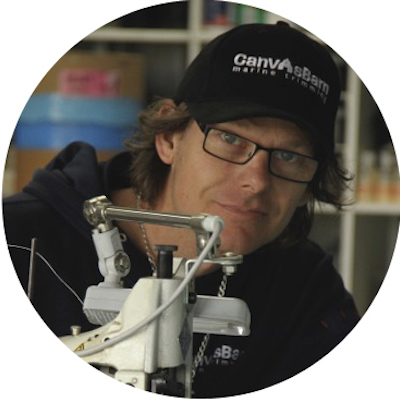 Aaron Stroud is an active member of Specialised Textiles Association (STA). He serves as a committee member for the Marine Fabricator division. He regularly travels in Australia and abroad to give instruction to other trimmers to raise the skill set across the industry. He is currently preparing to undertake his Master Craftsman Certificate, held by only a handful of craftsmen in the world. When designing a boat cover, Aaron starts with the end in mind. He looks at the lines of the boat. He looks at the structure and materials used in the boat and recommends fabrics that complement the boat and the way you use it. He thinks about where and how the boat is moored or stored and what special circumstances there might be. Is it very windy? Is there a lot of sun from one side? Is the water pooling on your old cover? Do you need access at a certain point? He wants to solve your problems, and make you boat look great. 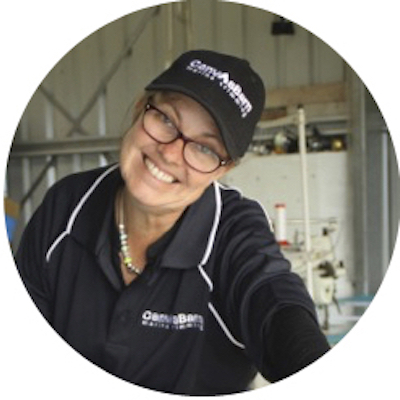 Kym moved to East Gippsland in 2008 to join the team at Canvas Barn Marine Trimming. She grew up in Queensland, and spent a lot of her childhood around boats. Her mum taught her to sew, and helped develop her sense of what works well. 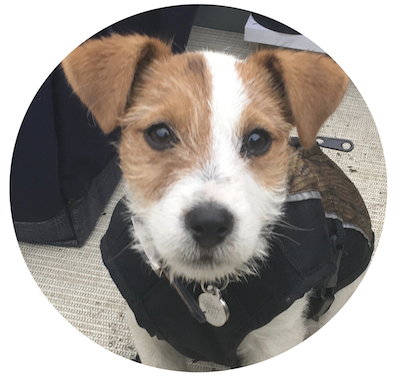 Today, she works with Aaron in all aspects of design, and installation, and loves helping you decide what fabrics will suit your boat. She’s mostly in the office, keeping the business ship-shape! 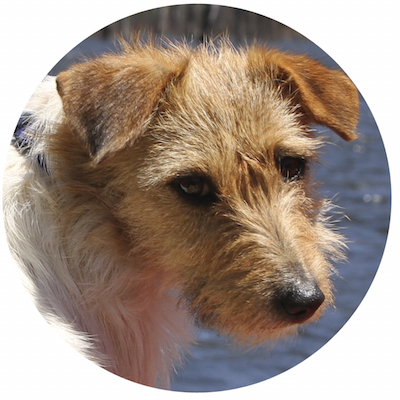 Zip, the workshop dog, joined Canvas Barn Marine Trimming in 2012 and has been a real asset to the team. She works hard at sleeping, chasing rabbits and finding the warm spot in the sun. Favourite food… meat and bones. She loves boating, trout fishing and camping on her days off. You’ll find her most days in the workshop. Lauren is the voice of Canvas Barn Marine Trimming. If you leave a phone message, you’ll hear Lauren giving instruction on the best way to contact us. Lauren has worked in the media for many years, on TV and radio, and is currently working in Phoenix Arizona. Lauren is founder of NFP followings.love helping build new community infrastructure in Uganda. See what we have been up to on Facebook. You’ll find our latest projects, those “bad jokes”, and other community info.